Any change to Microsoft SQL Server permissions or unauthorized access to highly sensitive information can result in a compliance failure, a data breach or data loss. With Microsoft SQL reporting tools and either SQL Trace or SQL Server Audit Log, you can generate reports on server activity with the help of SQL Server Reporting Services (SSRS). 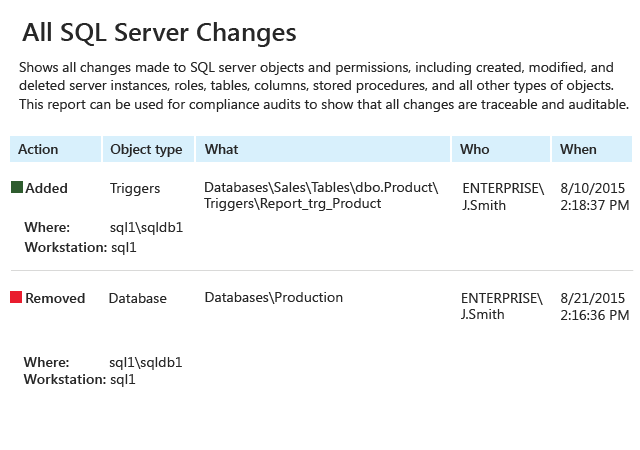 Reviewing these reports can help you track SQL Server 2016, 2012 and 2008 activity and spot potential insider misuse. However, using native SQL Server reporting tools to create SSRS-generated reports or using the SQL Server reporting systems is a time-consuming and error-prone strategy. You’ll need to spend significant time and effort creating and executing Transact-SQL queries to answer critical questions, such as who changed roles or how instance permissions were modified. Plus, you’ll need a lot of patience and a sharp eye to sift through hundreds of rows of data in order to put the pieces of the puzzle together from those hard-to-read reports. Are you ready for that? Or are you looking for a simpler process that eliminates Transact-SQL queries altogether? Netwrix Auditor for SQL Server streamlines reporting processes and delivers easy-to-read, actionable reports on SQL Server activity, so you can detect threats faster and get to the root cause of the problem before you suffer a breach. 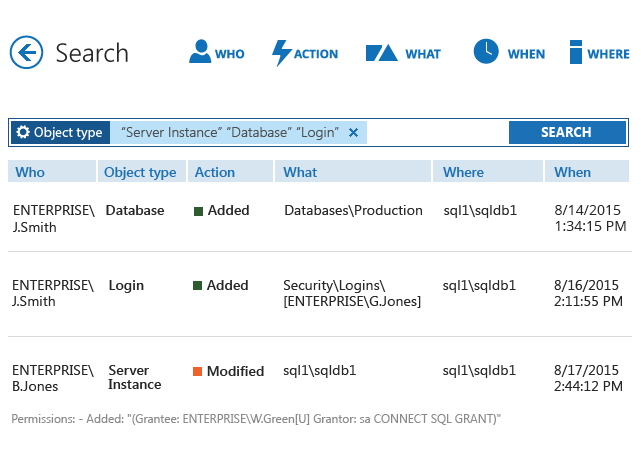 The reports are enriched with all the critical who-what-when-where details about changes to objects, permissions, server instances, databases, roles and tables, as well as detailed information about access events to your SQL Server, so you can strengthen security from top to bottom. Instead of painstakingly processing mountains of raw data, you simply access predefined audit reports and dashboards. 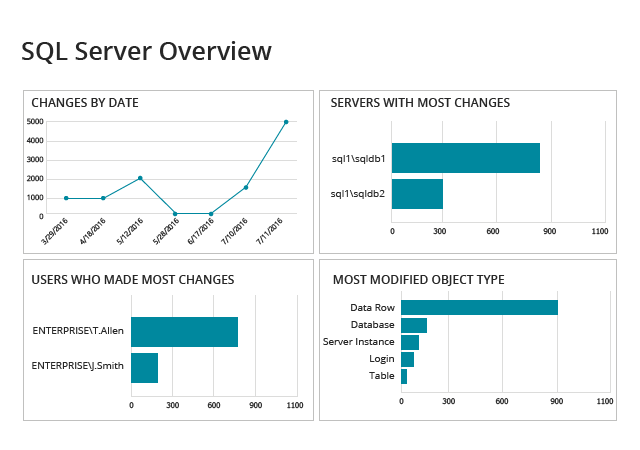 Gain a bird’s-eye view of activity on your SQL servers. Easily spot the servers with the most changes or unusual spikes in user activity, and drill down to investigate whether these actions were authorized. Keep a close eye on all attempts to directly access your critical assets, and identify abnormal logons that might constitute privilege misuse by malicious insiders. 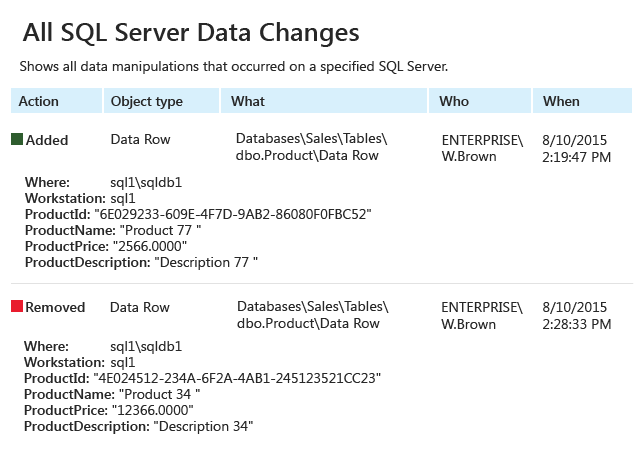 Instead of manually reviewing native SQL traces or analyzing scatter data from a patchwork of standalone reporting tools for SQL Server, get all the details you need about every change, such as a modification to an instance or a table, right at your fingertips. Minimize the risk of a data loss or a breach caused by unintentional errors or malicious actions by insiders. See what data was deleted, and when and where it happened, so you can respond immediately. Use the Google-like Interactive Search feature to easily generate custom reports that will help you chase down suspicious activity in minutes.